In this paper we argue that overlay multicast is an important technology for applications requiring a group communication service. With this approach end-hosts (running the application), dedicated servers and/or border routers automatically self-organize into a distribution topology where data is disseminated. This topology can be composed of both unicast connections andnativ e multicast islands (e.g. within each site). Therefore it offers a group communication service to all hosts, even those locatedin a site that does not have access to native multicast routing. One of the issues raisedis the set up of an efficient androbust overlay topology. In this paper we discuss several possible solutions. We show in particular the benefits of having a centralizedapproac h, of using redundant links and updating the topology based on a host stability criteria. T. Cicic and H. Bryhni. 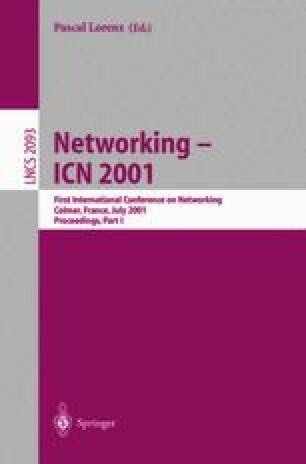 Multicast-unicast reector, January 2000. unpublished document, available at URL: http://www.i_.uio.no/_tarikc. P. Francis. Yoid: extending the multicast internet architecture, September 1999. Unrefered Report; http://www.yallcast.com.